Nobel Prize season is upon us. For the fourth year, we polled faculty members in the Kellogg School of Management as well as the Economics Department in the Weinberg College of Arts & Sciences at Northwestern University about their predictions for this year’s Nobel Prize in Economics. In over a week of voting, 42 faculty members responded with far-ranging predictions: 39 different prospective Nobel candidates were selected. 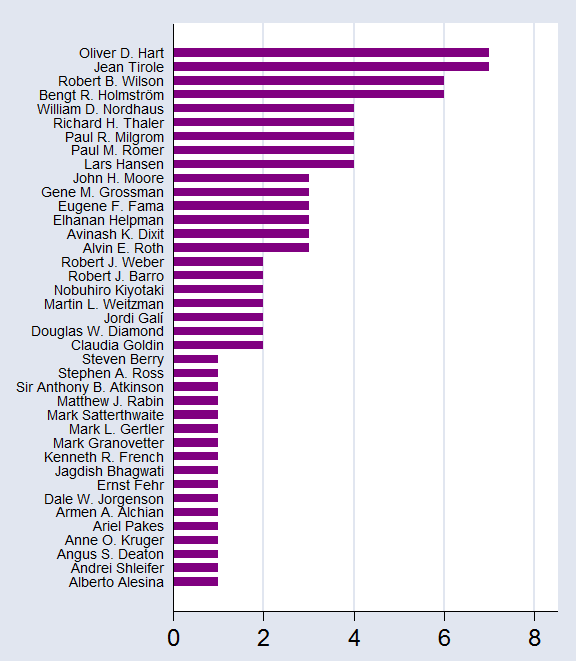 Two names top the list this year – Oliver Hart and Jean Tirole, each with 7 votes. Jean Tirole has a been a long standing favorite of our faculty, included among the top three names each year we have run the survey. He is a faculty member at the Toulouse School of Economics and has published widely in the areas of industrial organization, finance, corporate governance, and contract theory. Oliver Hart, a professor in Harvard University, is widely known for his work in contract theory, theory of the firm, and law and economics. 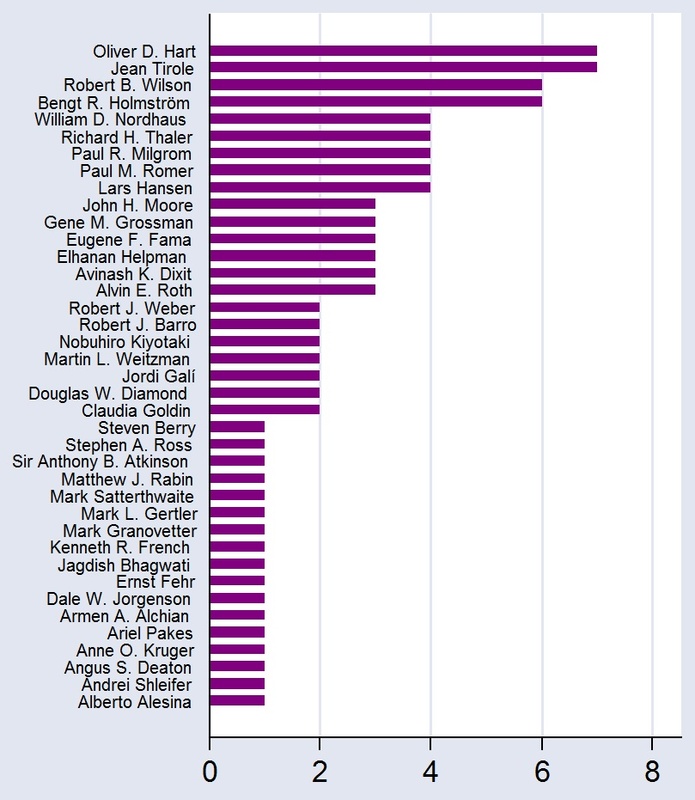 Hart and Tirole were the only names that garnered votes across four academic departments (out of seven), which might be interpreted as an indication of how influential their body of work has been across fields. On many occasions, the Nobel prize has been awarded to more than one scholar. One duo that surfaced in the survey was that of Bengt Holmström and Jean Tirole. Both have co-authored a number of influential papers on financial intermediation, theory of the firm, and liquidity. Attempting to further read the tea leaves provided by the survey would indicate that there is some expectation that mechanism design deserves another prize (the previous one was bestowed in 2007), with scholars such Robert Wilson, Paul Milgrom and Alvin Roth making it onto our list. In 2009, many were surprised that a non-economist (the late Elinor Ostrom) was among the Nobel winners that year. Could 2012 bring another surprise? One faculty member thought Mark Granovetter, an economic sociologist noted for his work on social networks and embeddedness, might be this year’s Nobel dark horse. The Nobel Prize in Economics will be announced on Monday, October 15 at 6:00AM CDT. Set your alarms!